I’m 6’3” and 280 lbs. I want to leave a model of hard work and dedication to all the kids playing football in Quebec. I want to let the younger player on my team know that when you do everything you possibly can the very best you can; you will become great at everything you want to do and you will never be unsatisfied of yourself. I want to become a very good football player of course. Plus, I want to apply the work ethic I acquired into my personal life. 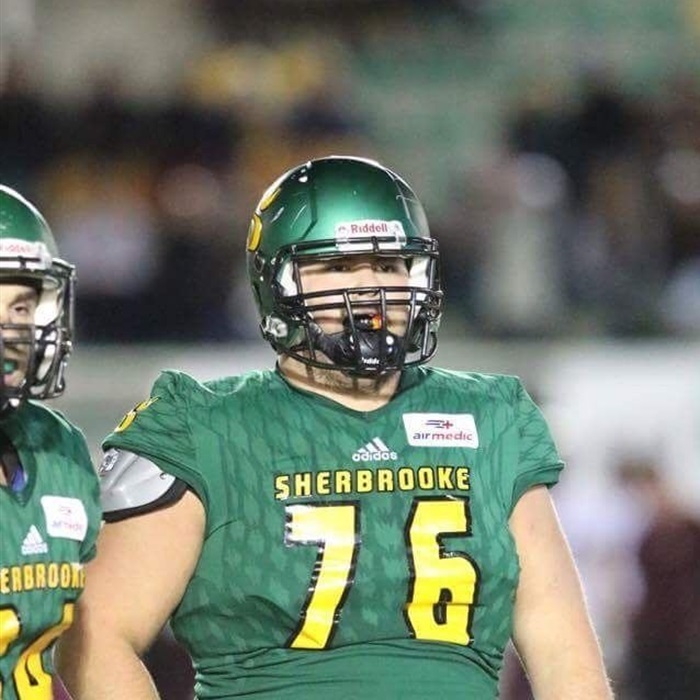 Definitely Charles Vaillancourt (OL, Laval University). Maybe it’s because I were younger when I faced Vaillancourt, but he was fast, mean and really tough to move. I can combine speed and power so OLs can’t cheat on me. My bullrush is good so my opponent has to respect that and I got good counter moves so they cannot lean on me. Heart, speed and mental skills. Damon Harrison, DT, Detroit Lions. Because he is a great run stopper. He’s physical and very athletic. My physical strength. It gives me the ability to crush the pocket so OLs have to double or even triple me in pass protection. Furthermore, I can play more easily in the double team when I defend the run game. The clinic research on the X fragile syndrome I did with the doctor in biochemistry François Corbin. Being able to help (in a microscopic way) people with a disease to get a better life quality is pretty satisfying. Ray Lewis of course. I just love playing alongside a very intense player. Especially when it’s my Mack linebacker. My mother. Because she gives everything she got to make people around her happy since I was born. She had me at 18 years old, struggled a lot, my father wasn’t there and she is now a wealthy women because of hard work and dedication. Be able to be happy every morning life gives you. I have only one 100% real brother since my parents split when I was 3 or 4. He’s name is Max. He is 5’ 10”, weights 125 lbs. and he is a circus artist. We are two very different person, physically and mentally. Still, I am really proud of him and impressed by what he does. He will leave in a month for China for about 2 years because he got a contract with the Cirque du Soleil.